Magnitude of the tragedy in Kerala is slowly unfolding as bodies of people who were not rescued have started floating. Thiruvananthapuram: The tragedy caused by massive floods across Kerala has started surfacing with atleast 15 bodies of people who could not be rescued started floating. Many of the bodies are of the old and infirm who were trapped by the flood waters and rescue teams were unable to reach them on time. At least 23 more deaths were reported across rain-devastated Kerala on Saturday. A red alert has been sounded across 11 districts warning of heavy rain and wind tomorrow. With roads cut off and public transport virtually non-existent, there are now fears of starvation. “If help won’t reach people will die of starvation,” said Chenganur MLA Saji Cherian. But with communication links snapped, people are desperate to get some food, potable water and medicines even as their hopes of getting rescued have started fading. The Kerala government is doing its best, but the magnitude of the flood fury is too large to handle. Prime Minister Narendra Modi, who conducted an aerial tour of Idukki and Pathanamthitta districts, announced an interim relief of Rs 500 crore for Kerala. He held a high-level meeting with state chief minister Pinarayi Vijayan and other officials on Saturday. He also announced ex-gratia of Rs 2 lakh per person to the next kin of the deceased. The state government however sought emergency relief of Rs 2,500 crore from the Centre, saying Kerala suffers losses of Rs 25,000 crores. Torrential rains have battered God’s own country since August 8, leaving over 200 people dead in the last 10 days in landslides and floods in what is the worst natural disaster to hit the state in a century. Out of the total casualties, 150 are said to have lost their lives in the last two days. An estimated four lakh people are now in relief camps, official said. A massive relief and rescue operation involving the Army, Navy, Air Force, Coast Guard, NDRF and volunteers continues to be underway. IAF rescue teams are also providing relief materials to stranded people. However, despite their best efforts, marooned people complained that they had to survive without food or potable water for many days. “The magnitude of the disaster is really great. We are finding it difficult to manage such a volume of affected people,” a relief official said in Kochi on Friday. 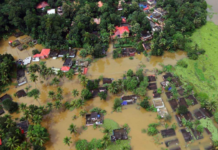 Kerala is witnessing its worst floods since 1924, when 3,338 mm of rain poured, in which hundreds of people have died and over two lakh people have been left homeless.